Boxing Day was blue and sunny, but with a biting easterly which discouraged us from taking gliders to the other side of the field for a launch. The excitement came from watching John and Nigel flying model jets off the power runway, very impressive. 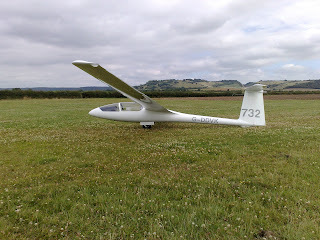 Today cloudbase was around 1200' so not much aviating to be done, though Steve did a sortie in the motor Falke. By the time it was back in the hangar the sky had cleared - isn't it always the way? Shortest day - longest flight? It looked unpromising, grey sky and the windsock horizontal. But the grey stuff was lined up interestingly across wind, if it had been Aboyne we would have been rigged and waiting for a gap. A tow to 1800ft into the bottom of the cloud, then a gap appeared, scraps of blue sky and patches of sun. And the altimeter stuck at 1800ft. All we had to do was crab back and forth along the Hambleden valley maintaining height, with the occasional blast of 4 to 6 kts as we passed a hot spot. Excellent fun for the shortest day of the year (according to my researches the solstice was at 1204). Just shows that it's always worth turning up and giving it a go. 9am Monday morning at Booker and it was fogged in solid. Martin remained positive and offered one of our intensive students some theory tuition if the weather failed to improve. Craig arrived late morning and learnt a good deal from Martin's blackboard session. Their combined determination forced the fog to clear at 12:30, leaving a clear sky and giving us the opportunity to get the aircraft out of the hangars. Three people flew for a total of six launches. A reminder that winter offers plenty of good weather for students wanting to progress and pundits wanting to keep current. Mike 7Q and I (Z12) had a good day flying along the Southdowns. to Truleigh masts where the ridge was bashing off 4kts. Past Devil's Dyke to the windmills then along Ditchling Beacon to Lewes at breakneck speed. Back to Parham was straight forward but the jump to Bignor ended quite low with sun in the trees making knowing where the ridge lay a bit scary. Ran down to Cocking then headed home for an early bath. Not pretty or fast but great fun. Flight on the ladder. knowledge to get the route right and grow some b**ls. suspect Booker will want a soaring fee as usual). I had an excellent day on the South Downs on Friday 31st. Great runs along the ridge with fantastic views of the Downs and South Coast. 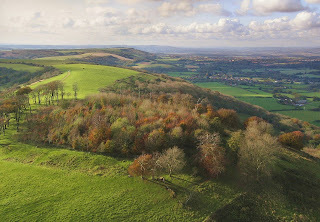 Mike is hoping to take the Duo down to Parham again for ridge running when the weather is suitable: another unique flying opportunity for Booker members whatever their experience level. The best wind direction is between slightly west of North to Northeast; with speeds over 15 to 20kts. 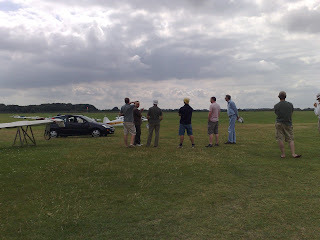 A number of Booker members have driven to Parham to fly for the day. It is well worth the drive to experience 100km of ridge. Apart from getting there and back having an engine is no advantage as by the time you realise you need it you are too low to start it. I unfortunately forgot to take my camera so the pictures are from last year; much the same apart from missing the beautiful Autumn colours. 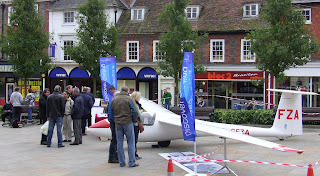 On Saturday 25 October the Sales and Marketing Team braved the wind and unforecast rain in Henley to promote gliding and the club and to sell courses and trial lessons. The Market Place was less busy than on previous visits but we did more business than many of the shops, and met lots of people. We look forward to seeing our visitors at the launch point. At lunchtime on Tuesday 21st October excellent conditions developed at Booker, with strong lift under the streets that formed in the stiff breeze. One pilot reported 4-5 m/s...yes, metres/second at about 14:30. KCZ even went out to Benson and back. Unfortunately there were only a handful of people lucky enough to partake and the day resulted in a meagre 4 launches. 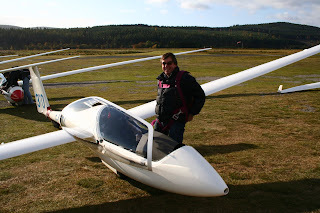 This year's expedition to Aboyne (to Deeside Gliding Club) was the best for some years in terms of flying weather, only 3 non-flying days in the three weeks we were up there. A total of 29 club members turned up at various times over the three weeks, ranging from seven for whom it was their first trip to veterans of dozens of visits. The flying was varied: thermals, wave, calm days and windy, and we came away with two diamond and two gold heights, congratulations to all, as well as some notable x-c flights. Our next expedition is likely to be to Shobdon, Herefordshire, in the spring. Before 8/8ths and rain came in to bring an end to the day. Tuesday was mostly overcast and lacked any form of wind but was adequate for a couple of circuits for Richard C before we all went on various walks. The week 3 crowd are clearly having too much fun in Aboyne and have no time for blogging, so here are a few pics from the first two weeks, stills from Bob's camcorder, his new toy. Sunday back in London (for some)..
A sky with every type of cloud, Thursday of week 2 when it was blowing a stiff south westerly. In the foreground is the glider formerly known as 249 (now ETY) - our old friend Derek was back again for another crack at the elusive diamond, leaving his Windrusher colleagues to try their luck at Portmoak. Snow on the mountains - a memory from week 1. 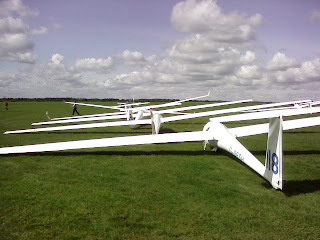 Deeside's glider rack in the foreground with Glyn's G1 in the centre. Dennis C, 370, Is on his way back from the western side of Scotland as i type. Wave seemed to carry on well above 19,000ft but access to the wave box was denied today, but sorted for tomorrow. Should we take off now? The wind continued strong from the SW, which made it interesting. Dave B flew in 315 first with Leon and then with Nick, on the second flight reaching 11,000ft. Mick C flew with Barry in ECZ and got to 14,000ft. Bob 279 went to 13,000ft and Steve JDV to 11,700ft. John 607 and William MH went to 6000ft and then tried to go somewhere else but with winds of 50kts at 5,000ft progress was difficult and after a while they were back on the ground. Jane 118 was also beaten by the wind. There will be more pics when time allows, we're all having too much fun to play around with computers. While we wait for the rain to pass, here's the latest from Booker in Aboyne. Thursday produced a fairly windy south westerly, and an unpromising looking sky. But Booker was not deterred, the following all reached around 9000ft or so before hitting the upper cloud: Dave B and Leon in 315, Mike C and Emily in ECZ, John 607, Steve JDV, Bob 279 and William MH. Denis 370 declined the opportunity having breakfasted on porridge with Drambuie served up by his hotel. The rest of the team leaned into the wind waiting for the landings, occasionally falling over when the rotor shifted and the wind on the airfield suddenly dropped. In the evening almost everyone met at the Huntly Arms in Aboyne for a surprisingly good meal organised by Leon, who is staying there. The Cambus O'May contingent then went back to their cocktail bar while the others dispersed to their various abodes. Today may well turn out good later on, if the wind doesn't pick up too much. And here's a picture of the afternoon tea earlier in the week, hosted by William, Bob and Jane at their house Clearfield. Pictures to follow, the views were spectacular. A wet easterly and no prospect of flying, so the team split up to find alternative diversions. Some went to Aberdeen, others went to the Bridge of Feugh in Banchory to watch the salmon leaping, and afterwards to the excellent cafe opposite. William MH, Bob 279, Jane 118 and Symeon FUN set off on a short x-c of 4.8km. Mostly the going was good but at one point they had to divert from track due to gorse and ended up in some serious sink. Later the team re-assembled at Clearfield, the house in the hills, for afternoon tea provided by Parker, Smith and Moore. It was quite a sight to see the gang making polite conversation while consuming tea and daintily cut sandwiches and cake. Well past the equinox now but still enough energy to give useful thermals as today's video shows. A little later getting going as the sun sinks lower, this timelapse video spans the 2 hours from 11am to 1pm (BST). Nice to see the grass is still being cut. 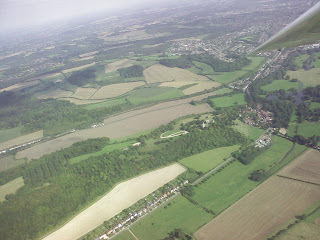 .........started unimpressive, good for check flights for Barry, Leon and Rolf. Most people rigged in hope, and after lunch there was a sudden rush of enthusiasm. 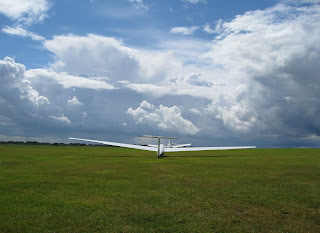 Booker took to the skies in an interesting southerly airflow with plenty of cloud. John 607 got to 13000ft, Steve JDV, William MH and Bob 279 to 9000ft or so, while Jane 118 was soon back on the ground. Symeon went to 5000ft three times in ECZ. Andy P and Chris R took 315 to great heights, giving Chris his first taste of wave, Mike C/Emily then went to 7500ft. Former Concorde Senior First Officer, Senior Training Capt 777 D. Byass and Rob Munro, Banker (retd) went to 8300ft in 315. Around 1700 we were thinking of calling it a day, but Barry/Dave B in 315 and Leon/Mike C in ECZ fancied another check ride. While they were in the air the sky recycled and they got to 7000ft in the late evening light and only came down because it was getting dark. Toys away, the forecast for tomorrow is for teashops. The start of Week 2 and lots more Booker people have arrived. A stiff northerly today, making for some interest on take off and landing. Various people launched and explored, but mainly found themselves experimenting with ridge lift: Andy P and Chris R in 315, then Mike C and Symeon, DR and Leon in ECZ, then DR and Barry, Glyn and Heggie in 3D, Steve in JDV, Bob in 279, William in MH and Jane in 118. John H in 607 cracked it, managing 2.5 hours and reaching the dizzy height of 5000ft. The wind dropped towards evening, producing ideal model flying conditions. So far Glyn and Bob S have crashed their models, John H and Mike C are still doing arms length aeros. 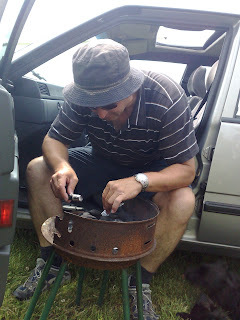 ...........was showery, too wet to rig, so we variously went shopping and lunched and ate cakes. For week 2 we don't have Birkelunn so the team has split up and is lodging in different places. There are plenty of interesting cottages and hotels around the area, handy for the airfield and with great views of the mountains and the weather. Friday continued with bright sunshine and some spectacular skyscapes as big showers of rain and occasionally sleet passed through. Finally Ed decided he had to leave, so Julian and Jeremy took 315 for the only flight of the day. The day finished with yet another fine dinner at Birkelunn, masterminded by Chef Jeremy. 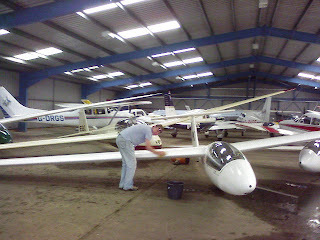 Saturday has dawned very wet and windy, so no flying for now. It's a day for exploring the local attractions. Rain in the night, snow on the local mountain, Morven, and an icy NW wind. So far there has been breakfast and tea drinking. Ed and Julian have rigged the Duo and are going to do a photographic sortie in due course. The day dawned clear and cold, a cloudless sky and ice on the wings as we rigged. Clouds were starting to form as Glyn 3D launched with Heggie, they found weak broken wave to around 4500ft. They were followed by Jane 118, Jeremy JDV, Bob D 208, Julian/Ed 315 and Don 318 who all after a while found that what they were actually flying in was thermals. But it was very enjoyable, the vis was excellent and the views superb. After lunch it looked as though the promised bad weather was arriving so we derigged most of the toys, leaving DR and Arnie still doing the rounds in ECZ. Then the wind picked up and Ed and Don had a short excursion in 315 and found wave to 4500ft in interesting conditions. Our master chef Jim P had headed south but he was ably replaced by Jeremy, assisted by Don, who produced a magnificent feast to end another excellent day. Wednesday 1st October was forecast to be miserable...and did not disappoint this time. A rescue crew of brave Booker pilots was assembled in the morning and departed at 9am in Roland's MPV with Glyn's trailer to retrieve 315 from Abington in southern Scotland, which is 198 miles from Aboyne, or 190 depending whether you are coming or going. 315 had to be abandoned there when one of the trailer's wheels fell off on the journey up. A few of the more optimistic, stupid and desperate pilots rigged early and then spent the day looking forlornly up at the low cloud base and intermittent rain. The day finished with yet another dinner served up by Jim P, aided by his two friends from RAF Leuchars. The forecast for the rest of the week is mixed but everyone is ready for the rain to break for some more great wave days. Tuesday 30th September started out looking bleak; high level cloud and a forecast of rain, with very little wind at ground level. DR and Don launched with the intent of doing some circuit practice in ECZ but nothing was heard from them for an hour, so the wave must have been working. Julian went off in 118 and got to 11'000, Jane and Roland shared a triplet of climbs to 5'000ft in ECZ, Arnie flew 318 and Bob got to 10'500 in 208. Ed Garner arrived in the morning after an eventful trailer towing journey, which left 315 stranded a few hours short of Aboyne and flew with Glyn in Duo Discus 3D. After lunch the conditions seemed to get even better, prompting Jane to launch again but this time in 118, reaching 11'600ft in bright sunshine. Jim went up in 208, got to 11'500ft and flew halfway to Feshiebridge before retreating in the face of strong sink on the downward side of a wave bar. Jeremy experienced an interesting reversal of fortunes in JDV when exploring why not to co-ordinate stick and rudder during the landing ground roll. His rapid 180 degree turn did however give him an excellent view of the gliders on final approach. Ed and DR experienced a very interesting flight with a combination of both thermal and wave flying. A few drinks in the bar and dinner at Birkellun rounded off another fantastic day of mountain soaring up here in Scotland. Up early and rigged and ready to go. DR flew with Don in ECZ and introduced him to wave, they got to 10,000 before the -9degC persuaded them down. Jim 208 went to 10,500, then let Bob D take it to 7,000. Jane 118 got to 10,700 and Roland 318 to 8,200. 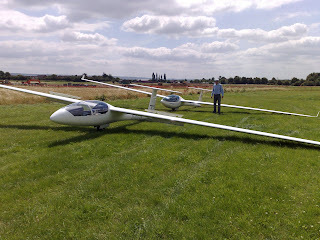 Jeremy flew with Glyn in Duo 3D and reached 6,000. Then the wave collapsed and there was a mass landing for lunch. Refreshed and refuelled, DR flew with Arnie who then had a brief go in 318. Excellent fun. It's started to rain now and all the toys are away, but the bar is open and the whisky is good. More of the same tomorrow if the forecast is to be believed. 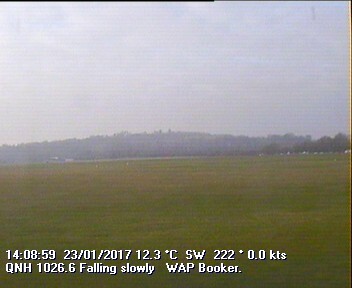 The annual Booker expedition to Aboyne (Deeside GC: http://www.deesideglidingcub.co.uk/ - check out their live webcam) has got off to a good start. Sunday dawned cold, but it looked as though it was waving, so Glyn G1 set off and got the climb of the day to 7000ft. Then the thermals set up and it was a question of 'this feels like wave, oh no it isn't, I'll just go round in circles'. But it was a very pleasant opportunity to make sure all the kit was working and that the mountains were still in the same place. Everyone flew: Don in ECZ, Roland and Julian in 318, Jeremy in JDV, Bob D and Jim in 208, Jane in 118. We packed up at around 1700 and went back to Birkelunn for a magnificent dinner cooked by Chef Jim. Meanwhile Lasham found the evening wave, landing after sunset. 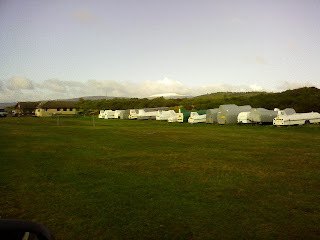 Today the sky looks more promising, the air has dried out and the wind is blowing. More later. Glorious sunshine, and a grid to launch. Silverstone-Graffham not a bad task for mid-September. 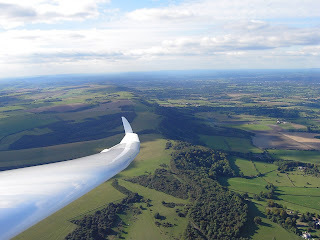 Back at Booker, local soaring in the K18 brought back memories of 50k attempts, getting to 1400ft over the Golden Ball as a starting point for an attempt on Lasham, no GPS, just the map and compass. Two more weeks and Booker will be heading north to Aboyne for some wave soaring. The 'Get your Solo' week 8-12 September worked for Mark Wolff, despite the weather. And today the sun finally returned, giving us a busy afternoon. Yan did yet another hour in the Junior to keep his Bronze qualifications in date, and scored bonus points for cleaning it afterwards. More late summer tomorrow, with luck. Most pilot elected to do the bigger task and a few chose to do BOB-LAS-BIC-BOO instead (presumably to wave down to the folks at the Air League at Bicester today). At the start, several gliders reported good climbs to 2700', above which it all went a bit weird (very choppy and lots of sink). Most pilots completed the tasks, although 971 and JDV landed at Thame and were aerotowed home. Meanwhile back at Booker G-DDXX (ASW19 competing in the ICL from Lasham) called in to say Hi and was later towed home too. A busy day with more than 60 launches of various kinds. We started on 35 but after a while had to change to 24 as the wind came round to the west.Once we had launched the cross country grid we had a busy afternoon of two seater flying, finishing around 1800. Even after the top cover moved in it was still possible to soar locally. Four landouts reasonably close to home and one at the top edge of the Southern chart. A surprising number of members appeared to have no jobs to go to yesterday, here's a sample of the grid, and the sky we launched into. A classic soaring day, more of the same please. 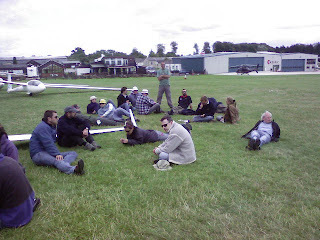 Some private owners and a number of club pilots came out to play yesterday 14.8.08. Mike Gardener soared for a couple of hours in the junior preparing for his 50km attempt and Henry Ross did a couple of hours in GBF dusting off the cobwebs from his lay off. Conditions were excellent from 10.00-16.30 with 4-5kt thermals, 3000ft + cloud base, winds 10kts @ 240. There were a few showers about all of which missed us until about 17.00 when we had a light sprinkling after which the wind dropped to 4-5kts and the sky opened up, just perfect for a first solo. James Stanley lives in Hong Kong and while on a visit to his grandparents in 06 he spent a month or so almost every day at the club and became an unofficial cadet. James now aged 16 returned this summer and went solo much to the delight of his grandfather and father both whom are pilots and were on hand. Grandfather was on the field and gave father in Hong Kong a running commentary by phone while he monitored the weather via the BAFC website. Needless to say James is planning to continue the family tradition and become a professional pilot – well done James. Today the rain cleared earlier than expected with the sun coming out about 9ish, the ground was a little damp after the heavy rain but it quite quickly dried out. Cloud base rose to 3000ft+ with solid 5-6kt thermals to be enjoyed if you launched at the right time between the periodic showers. At the peak the winds were 20 kts gusting 30, not too rough but sufficiently challenging to test our student pilot’s circuit planning. Good day. Everybody is back, prizes were given out (I'd say more about this but I missed it! ), and another Booker Regionals is over with for another year. Well done to everybody who took part and also to everyone who helped out. Another fun, safe, competition with more smiles per km than anywhere else! !14, Z12, 370. T6 .are back 732 is at Bicester. Task A. Been watching the Cu building. This could be a fast race. Task A - Booker Bridge (BOB) - Membury (MEM) - Calvert Junction (CAL) - Chipping Campden (CHC) - Booker SW (BO1) - Booker Finish 1 (BF1) - 255.1km. Task B - Booker Bridge (BOB) - Ilsley (ILS) - Calvert Junction (CAL) - Moreton-in-Marsh (MOR) - Booker SW (BO1) - Booker Finish 1 (BF1) - 207.6km. First launch not before 11:30. Oh, and the Battle of Britain flight is flying all over the Country today so need to keep an extra special lookout for them (for nostalgia purposes of course). Day 6 The Final Countdown! It's going to be rather hot with light variable winds today. The sort of weather that "The Public" love whilst the gliderpilot swelters under the canopy. There's under 600 points seperating the top 10 places and only eight points between 1st and 2nd currently. I wonder if everybody is hoping for a long task to ensure it's a 1000 point day or if everyone is going into "end of competition-itis"? Gliders are being towed out to the grid before the briefing at 10:30. I wonder where we're going today ? Watch this space and I'll give a post-briefing update later. Turned out to be a good racing day and everybody made it back to base ok. The provisional scores have been published but I thinl we're still waiting for a couple of loggers. Fastest time around task is currently looking like Matt "Cook FM", flying H/C in Discus "2A". Fastest competitor was Jan McCoshim in LS8 "161", taking 2h 56m to complete the task. We're going to have a barbeque this evening, so maybe everybody had an extra incentive to make it back? Still on A task of 270km. Task A - Booker Bridge (BOB) - Calvert Junction (CAL) - Great Witley (GTW) - Booker SW (BO1) - Booker Finish 1 (BF1) - 270.7km. Task B - Booker Bridge (BOB) - Calvert Junction (CAL) - Evesham (EVE) - Booker SW (BO1) - Booker Finish 1 (BF1) - 201.8km. And today's challenge is to work out what on Earth the weather is going to do. Everybody has different opinions varying in range between dire and excellent. Who knows what'll happen? Today's briefing will be at 10:30, that should give Nils plenty of time to scour his information sources, look at his abstract art/ink blots and work whatever magic it is that he uses to produced forecasts with such unnerving accuracy. Just waiting for the better weather to roll in from the West but it didn't. So the day is scrubbed. Bicester had scrubbed by 13:45. Like us, they've now posted a pic on their website of their competitors. Can only see one smiling face amongst the competitors though...I guess with the Sports Class having flown on only two of the comp days that there's some fairly bored people there. We may have a smaller comp but we're able to make better use of the conditions, have more flying and lots of fun! First launch no earlier than 1415. Wind is now WSW so we've relocated to use runway 24. Also switched to B task. First launch no earlier than 14.15. First launch delayed until 12.30. Meanwhile Jon unveils his secret thermal generator. Metman reckons there might be a sufficient window to use before it turns showery/thundery, etc. 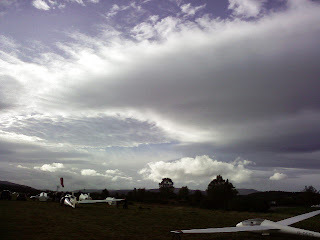 although cloudbase is likely to rise to no more than 3000'. Task A - Booker Bridge (BOB) - Oxford South (OXS) - Newport Pagnel (NPT) - Booker SW (BO1) - Booker Finish 1 (BF1) - Booker (BOO) - 144.0km. Task B - Booker Bridge (BOB) - Oxford South (OXS) - Calvert Junction (CAL) - Booker SW (BO1) - Booker Finish 1 (BF1) - Booker (BOO) - 101.8km. First launch not before 11:15. Apparently this was then changed to 12:00. Oh, and apparently I was wrong about Jim in Z12 yesterday. He did fly further than our fledgling Junior pilot who made it to Bidford. Jim flew over 100km although the results show a handicapped distance of 91.7km. I wonder what the handicapped distance of a Junior completing 93km is? We're off to the grid to watch the very unstable airmass developing to the North and West. Feeling quite humid already but the brisk Southerly breeze is keeping it quite pleasant on the airfield. Nils suggests that it won't rain at the airfield but there's likely to be some quite large showers developing elsewhere. Day 5 but will it rain ? The warm weather is set to continue into the coming weekend and the early part of next week, however with low pressure attempting to dominate the weather from the southwest, there will be a growing risk of some afternoon or late evening heavy showers or thunderstorms developing, set off by the high temperatures. Despite a nationwide risk, it will be inland parts of the UK that are at greatest risk and these include, Wales, Midlands, Northern England and parts of Scotland. Where these showers do develop some locally torrential downpours are possible along with lightning, hail and gusty winds. Conditions may progress from fine and sunny to highly inclement within a short period of time. Dunstable's forecast suggests that the day will end around 14:30 'at best'. Lasham suggests a 300-400km task is possible. H'mmm, let's see what our Metman and Task Setter decide! Briefing as 10:00 and I'll post an update later. Day 4 Gone for a curry! The blog hasn't been updated much today because we started launching at around 12:15, I made it back to the airfield just before 4pm and then went to help retrieve Hugh MacDonald, who had just completed his first 50k cross-country flight. Well, I say 50k but he made it to Bidford which is actually 93k. Not bad going in a Junior and further than what someone in the comp achieved in a somewhat higher performance glider (and who failed to listen to his own sage advice about AAT's, i.e. don't land out). 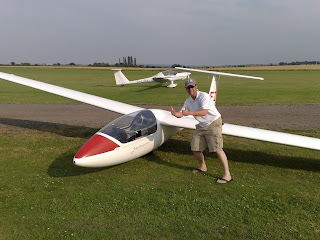 It took us so long to fly the tug to Bidford (even with a 20kt tailwind) that Andy Betteley insisted on doing a cool pose next to the glider (actually, it's not a cool pose AND he wears sandals). Anyway, we managed a quick turnaround with the help of one of the Bidford club members and headed back to Booker in order to meet up for the Curry Night that Denis had organised. Let's hope the weather isn't too good on Friday! Metman was delayed as he was flying back from the Isle of Wight and the winds were a bit strong for his Cub. So, we did an initial review via the more traditional sources and when he arrived he validated what was generally though - increasingly strong SE/ESE winds, thermals to 5000' going blue with the odd small Cu appearing here and there. Day likely to die off around 17:00. Booker Bridge (BOB) - Moreton-in-The-Marsh (MOR, 25km circle) - Northampton South (NOSA, 30km circle) - Booker SW (BO1, 1km circle) - Booker Finish 1 (BF1). This provides a range of distances from 114.5-307.1km. As we didn't fly yesterday, today is classed as Day 4. The briefing is set for 10:30 and the conditions look favourable for a good task task so everybody will be gridded up and raring to go. Just hope that the Metman makes it back from the Isle of Wight in time for the briefing. Meanwhile the Cotswolds and Northamptonshire look like good task areas. Time to put the gliders away. At the rebrief it was announced that we would fall back to the shorter B task. First launch not before 14.00. Task A BOB-MAR-HUR-BO1-BF1 147.9km. Task B BOB-MEM-CHV-BO1-BF1 107.4km. We await the Metman to provide inspiration. The Metman reassures us that there could be a usable window in the next few hours. We're all looking at his charts with renewed interest as he keeps being spot on with his forecasts. And to think we thought his charts were just modern art until now. Cloudbase just reported as 2200' with good 3kt climbs. First launch possible at 12.00. Suspect 13.00 is more likely. And likely to get warmer. Briefing is at 10:30 and the Task Setter has been seen wondering around with task sheets already. Update after briefing. Day 3's winner was Denis Campbell. The picture shows what the sky looked like shortly before launching. Everyone is back now and we're in the bar enjoying the pleasant evening. Around 8 or 9 pilots completed the task. Well done to 580 who got around, realised that he hadn't made it around the last TP and so climbed back up at Booker and went back and turned the last TP before getting back. Well done. And lands out at Lewknor. Oh well, it's a nice field. Sniffer dispatched and the grid is launching in 10 mins. Brian the task setter has been launched as a sacrificial offering to the thermal gods. Let's see if it works. Well, it didn't. As noted in the comments, the sniffer is back on the ground. Metman says we're going to have spreadout fairly early on and it isn't going to burn off. However there should be thermals 2-3kts that will go up to cloudbase of around 3000'. I'm on the front of the grid today and first launch is scheduled for 11:15. Let's hope it's delayed so I can climb into my glider quickly enough! Scores for Day 2 continue to be in a state of flux as the loggers from the landouts are added into the equation. Position wise, Jim White (Z12) won the day with a speed of 85km/h followed closely by Denis Campbell (370) at 82.2km/h. Anecdotal evidence (the best sort!) reveal that Ben (in 580) did 174.5km in his ASW19 and Phil C (971) did 173.2km in his ASW19. So, maybe some competitive rivalry between the '19 pilots? Field landings (and retrieves) were all done safely although there were comments about paddling through water to get to one unfortunate glider! The briefing has been delayed until 10:30 this morning which gives Neils the Metman a few extra minutes to pontificate over what's going to happen today. His forecasts have been very, very accurate so far (his forecast of 6kts yesterday and the day gradually going blue was spot on). Let's see what he thinks of today. Just waiting for 315, T6 and 279 to return home now. EN landed a few miles short near to Lewknor. Good effort Neils! Main bonus to 580 for (I think) completing the task as it could well be his first 300k (and in an ASW19 - not easy in today's winds). Z12, A9. GA, JTU, K4, 325 and 370 have all finished. 971 made it to Pitsford and back. 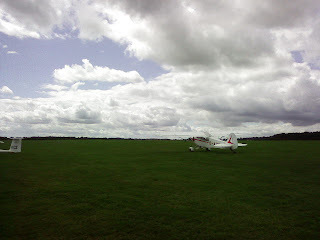 732 and JDV landed at Thame (see pic, showing a deceptively good sky). CH is in a field. FUN is at Halton. 161 is in a field near Northampton. Meanwhile 279 is about to take a tactical late relight. Dave C abandoned his 500k and took a launch back from Bicester. Now he's called start for the comp task here. Does he never give up? Gate opened with max start height 2800'. Several relights and at least two landouts so far. 732 and JDV are at Thame awaiting aerotows home. It was certainly very thermic locally, Lane End was a consistent source of strong lift, but the howling gale and rough conditions made it a bit tough on occasion for students. With a lighter wind the clouds beyond the ridge would have looked quite inviting. Cold on the ground, difficult to believe that it's mid July. Tomorrow will probably be better, when most of us are back in our offices. After assessing the conditions the grid was stood down by 16:00 and the day was scrubbed. Oh well, saved on the launch fees. Tomorrow morning the briefing will be at 10:00. Early indications are that it could be quite a good day. Let's see in the morning. Matt has been dispatched off in the Duo 315 to check out conditions in the task area. Report doesn't sound very positive, so first launch has been deferred to 14:00. The grapevine has heard that it's raining at Bicester, so probably better that we wait a little longer to see if conditions improve sufficiently. 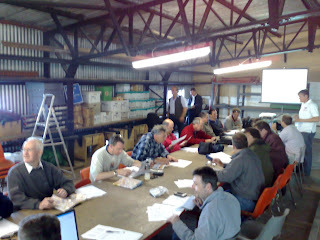 Briefing held at 11:00 where the previous day's results were reviewed - after much haggling/scrutinising, etc. Denis Campbell (370) and Jim White (Z12) tied for first place and gained 304 points apiece. Third was Jon Gatfield (T6) who had completed 78k before turning for home. Today Neils the Metman descibed how the various models were predicting spreadout (or not quite depending upon which model you prefer). 25kt WNW winds, cloudbase 3500-4500' (4500' if spreadout breaks up). With the possiblility of some sun getting through to the ground there's hope of 4-5kt thermals. 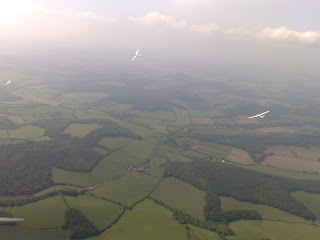 Bicester is tasking between Newbury, Keevil and Buckingham so there won't be many other gliders marking the thermals. Lot's of local little airshows today, so plenty to watch out for. First launch is not before 12:00, so better get to the grid now! .........and here's the sky they were ignoring. Denis 370 and Jim Z12 are out there somewhere. Finally the grid launches, into a more promising sky. Z12 is probably on final glide. 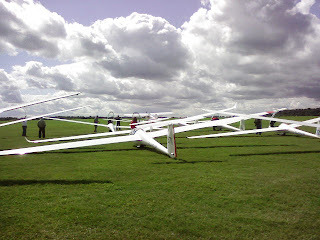 19 gliders launched at various times (majority after the start line had opened). 949 landed at Abingdon, JDV landed at Chalgrove. Retrieve crews/tug are on their way to retrieve them. Scorer is busy working his way through the traces to work out the scores. Z12, 370 (who both set of early) completed the task. Quite a few made it around the first TP (Oxford East/Headington) and returned back to base. Rumour has it that 370 has won the day....watch this space for more details. All in all a difficult day with strong, gusty conditions, wave influence, lowish cloudbase (3500' around Booker) but a great deal of fun. Here's to Day 2! First launch set at 12.45. Everyone is on the grid talking about streeting vs wave vs ridge running. We started launching but it soon became obvious that it was less that ideal conditions. Several pilots opted to not launch and were later vindicated by the return of all those who had launched. The grid is now repositioning to the Clubhouse while a shower passes through. 10 kts WNW surface wind building to 30 kts at 3000. Cu expected to 3500. Day ending by 1800. So, task A set as BOB-WEC-MAR-BO1 166.4km. Task B BOB-OXF-MEM-BO1 121.9km. First launch not before 12:00. Office is staying open until 6pm this evening so that entrants can go through the registration process. A few last minute entries has seen the list grow to now comprise 18 gliders (21 pilots). Website will be updated later this evening (theer could still be a few more last minute stragglers!). The office will re-open at 08:30 on Saturday for the remaining competitors to register before the first briefing. Jim's seaweed and prognosis of a high over the Azores seems to have scared the nice weather off but an interim forecast of light showers, a fairly low cloudbase and a brisk Westerly breeze means we may even get to fly a task on Day One! Booker Car and Van Wash.
Three drowned rats (four if you include yours truly) shelter on the last bit of dry land.